NEW YORK (CNNMoney) -- U.S. stocks were headed for a mixed open Thursday, with tech shares in the spotlight, as investors react to Apple CEO Steve Jobs' resignation. Investors also digested the latest news on labor market. While first-time claims for unemployment benefits rose more than expected, ongoing claims dropped to the lowest level since September 2008. The U.S. economy has been on shaky ground and stocks have been quick to react to any positive or negative news as they look for signs of an improving recovery. Dow Jones industrial average (INDU) and S&P 500 (SPX) futures edged slightly higher, while tech-heavy Nasdaq (COMP) futures were in the red ahead of the opening bell. Stock futures indicate the possible direction of the markets when they open at 9:30 a.m. ET. Shares of Apple (AAPL, Fortune 500) were down 2% in premarket trading after co-founder and two-time CEO Steve Jobs resigned late Wednesday. The stock had fallen more than 5% in after-hours trading on very heavy volume. Premarket trading volume was heating up, with nearly 1.5 million trades changing hands. Former Chief Operating Officer Tim Cook will replace Jobs, who will remain chairman of the second-most valuable company in the world. Aside from Apple, investors remain focused on the economy. Since the start of the week, investors have been gearing up for Federal Reserve Chairman Ben Bernanke's key speech on Friday for further hints about the health of the economy. This week's three-day advance has been attributed to investor hopes that the Fed chief will announce steps to spur the faltering economy. At last year's meeting, Bernanke prepared the market for QE2 -- a bond-buying program that is widely credited for supporting stocks earlier this year. Economy: The Labor Department's said weekly jobless claims rose by 5,000 to 417,000 last week. Investors are looking for unemployment claims to fall to 400,000 claims. Continuing claims, which include people filing for the second week of benefits or more, fell more than expected to 3,641,000, the lowest level since September 2008. 0:00 / 3:14 BullHorn: Is worst over for BofA? World markets: European stocks were mixed in afternoon trading. Britain's FTSE (FTSE) 100 edged lower, the DAX (DAX) in Germany rose 0.6% and France's CAC (CAC) 40 climbed 1%. Asian markets ended with gains. The Shanghai Composite (SHCOMP) added 2.9%, and the Hang Seng (HSI) in Hong Kong and Japan's Nikkei (N225) increased 1.5%. Currencies and commodities: The dollar fell against the euro, but rose versus the Japanese yen and the British pound. Oil for October delivery gained 68 cents to $85.81 a barrel. Gold futures for December delivery fell $36, or 2%, to $1,721.30 an ounce, marking the second-straight day of big declines. Gold prices tumbled 5% Wednesday. The pullback comes after a powerful rally in the gold market that sent prices skyrocketing above $1,900 an ounce earlier this week. 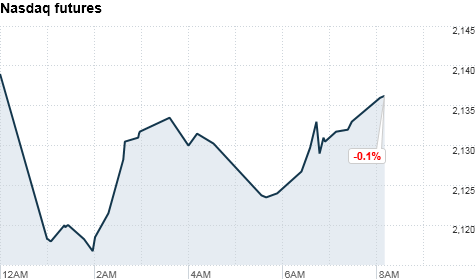 Bonds: The price on the benchmark 10-year U.S. Treasury rose, pushing the yield down to 2.30%.